Learn with Play at Home: Activities and printable resources for preschoolers. "Three to Five. Playful Preschool" e-book. Activities and printable resources for preschoolers. "Three to Five. Playful Preschool" e-book. Today I'm very excited to be sharing with you, a project that I've been working on with a fabulous group of bloggers. 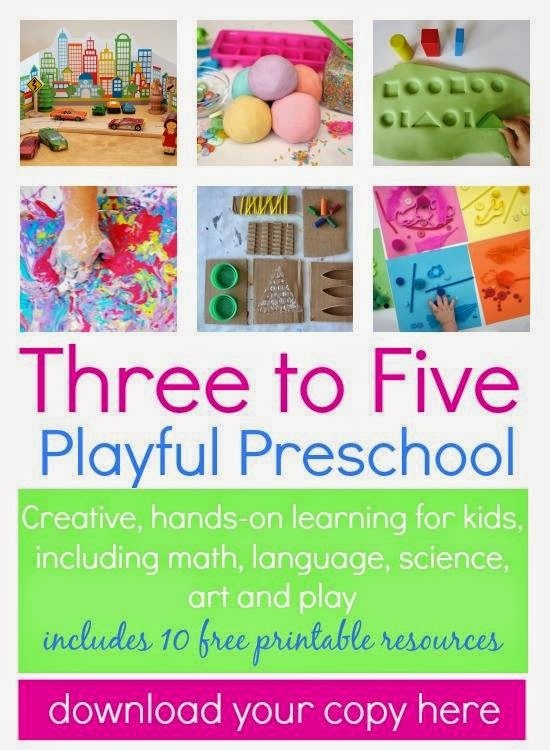 Coordinated by Cathy from the fabulous site, Nurturestore, we have produced an e-book full of hands-on, play based learning activities suitable for 3-5 year olds. This resource brings together some of the best play based kids activity bloggers on the net, in one handy book that you can print and access whenever you need it. 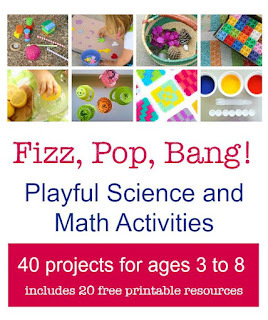 A large range of activities covering areas of math, language, literacy, science, art, fine and gross motor, play and more. While you're here, be sure to check out our fun Maths and Science E-book too! I was one of those parents who were fortunate to be at home during my children's early determining years. I worked out of my home and traveled when our first son was young and we could take him with us as traveling. Once he turned three years of age, we decided to put him in a preschool which only met in the mornings and we select three half days a week. We required our child to have the best preschool. They learned self-help skills, responsibility, and how to obtain their own snack and drink set out properly on the table. They each took turns with assigned jobs such as door holder, line leader, snack helper, calendar girl/boy, pet feeder and a few others that would vary during the year. When my children were old enough to be on their own at home, I went back to job full time in the classroom as an early childhood educator. I have skilled in both public and private school settings. I believe there are five primary, vital reasons why a preschool is a vital option for the children and parents. Preschool education is the requirement of the time as most of the parents are working. As well do not have the best time to spend with their children. Most of the babies are left at home with striking parents or helpers who are not able to direct them the method they should be. Thus Pre School is not a place to appear for mastery in the syllabus in its place it is a place where the children do all types of activities that are tempting to them and teaches them in a unique way. It assists in a child’s personal growth. Although a child learns how to converse while at home, in preschool continuous dealings and contact with children of equal age group and teachers help them to improve their communication skills.